If you’ve been following along, you’ll know that the Book Showcase for my first book is well underway. Over 25 bloggers are sharing their creations with us every day in September. 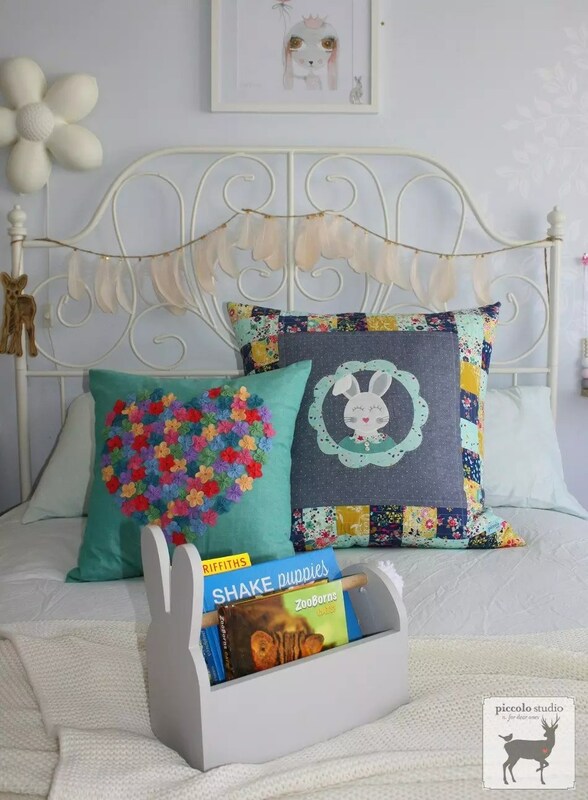 The first week of the Pretty Handmades Book Showcase brought us some beautiful makes. And I can’t believe it’s already the end of Week 2! Once again, the bloggers have outdone themselves. 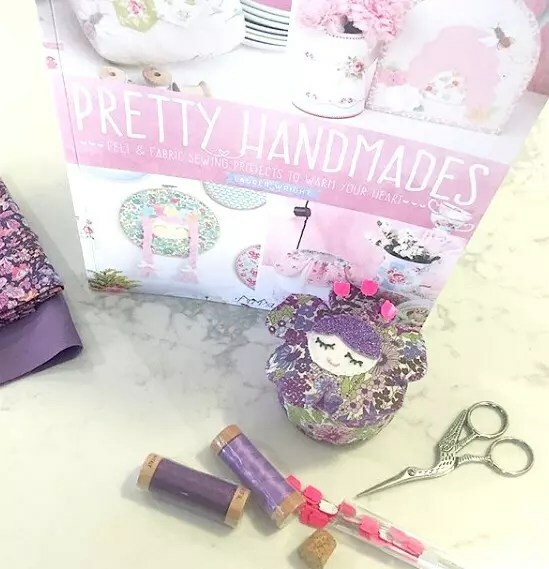 If you’d like to know more about my first book, you can head here to purchase Pretty Handmades: Felt and Fabric Sewing Projects to Warm Your Heart , or read more about it HERE. 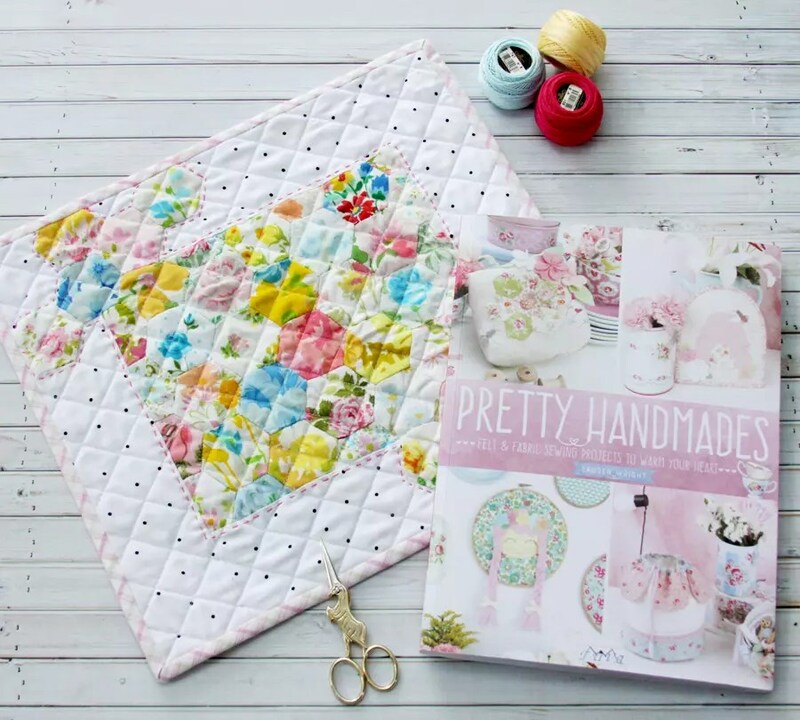 Sarah from Piccolo Studio made two beautiful projects for the Pretty Handmades book showcase, both for her daughter Hannah. The first was a modified version of the Hoppy Squares Table Tidy. 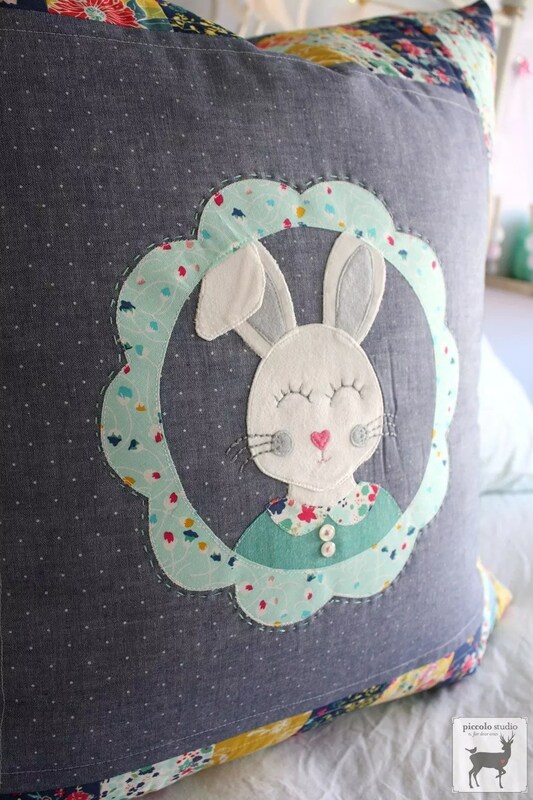 Sarah’s turquoise version was made into a cushion for her bunny loving little miss. And isn’t it glorious? It’s going to be so well loved! Sarah also made great use of the felt flower templates that can be found in the book. 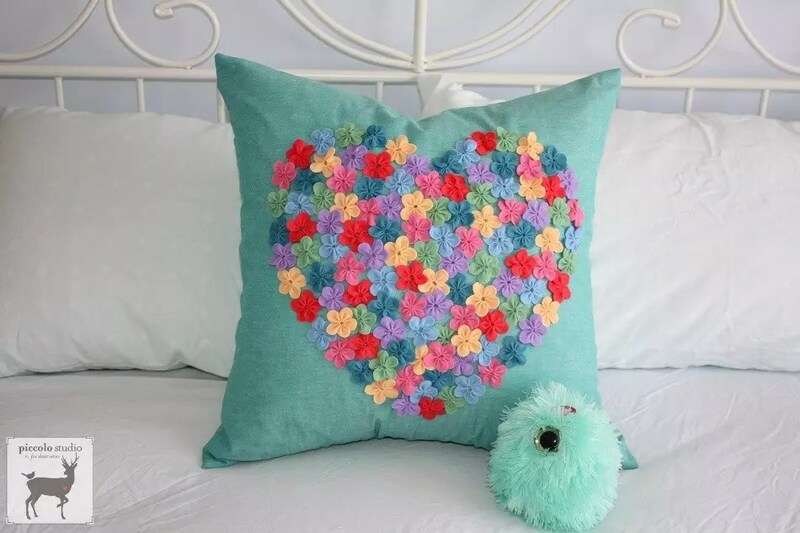 She hand pieced 160 felt flowers to create this beautifully intricate design for her second cushion cover. And she has a few left over, so she’s finding new and creative ways to use them in her sewing projects. Martina from Ava & Neve sells the most comprehensive range of Liberty Tana Lawn fabric. So I knew when it was Martina’s turn for the blog tour, it was bound to be Liberty lovely! How clever that she added fabric to her wool felt to create this lovely version of one of the Flower Friends Pin Cushions. Isn’t she sweet? 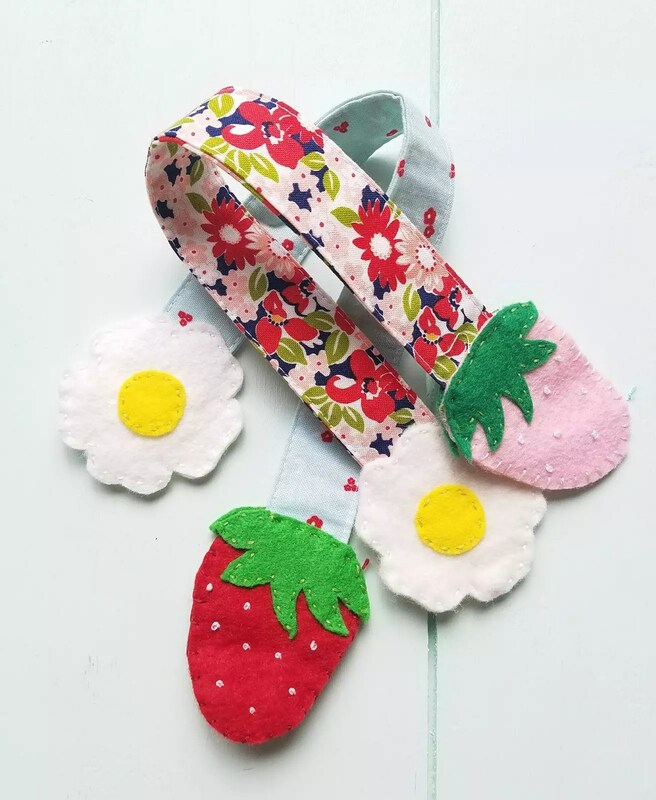 Heather from Quilt Story had fun sewing the Strawberry Surprise Bookmarks. They’re a quick and easy sew, but they look so lovely! Having four daughters, Heather said she’s going to have to make a couple more! 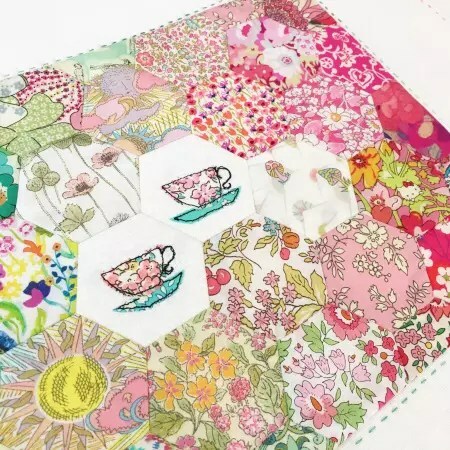 Faith from Sarana Ave was drawn to the Garden Path Mini Quilt because it was the perfect way to showcase all the hexies she’s been collecting from the different swaps she’s participated in. Isn’t that just so heartwarming? 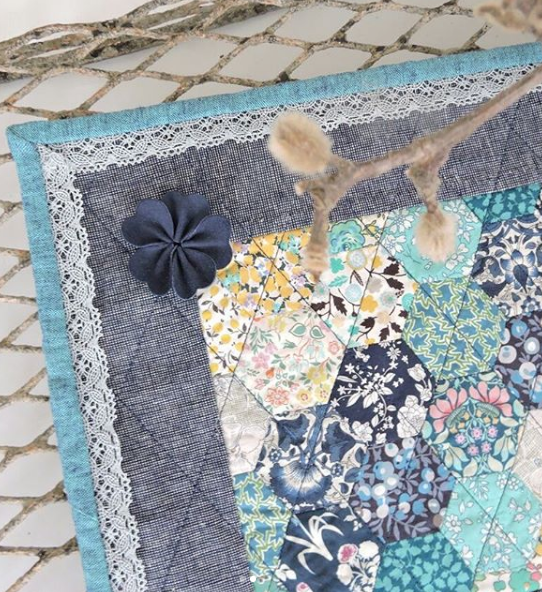 I love her hand quilted details using variegated thread. And I love the graduated colours in the placement of the hexagons. It’s great to see how everyone is making these projects their own! 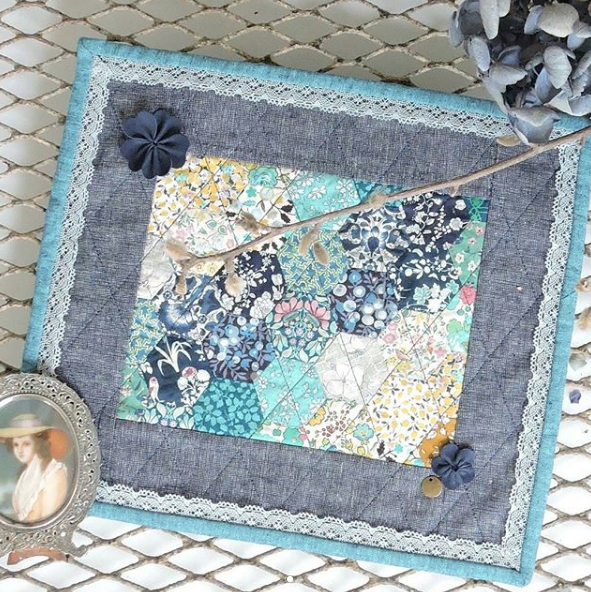 Alisha from Ministry of Fabric also made the Garden Path Mini Quilt. It was her first time working with Liberty fabric, and doesn’t it look sublime? Finished with gorgeous quilting, vintage lace and handmade leather flowers, it’s bold but still delicate. I love it! 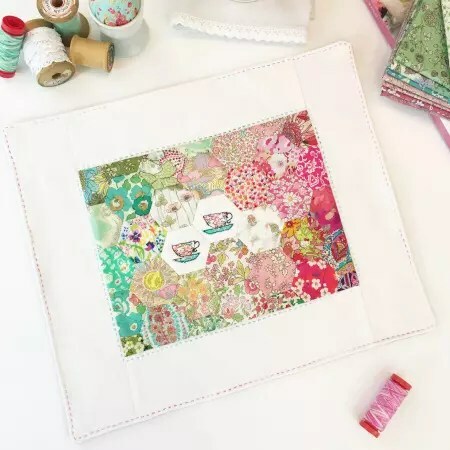 For the third consecutive day, the Garden Path Mini Quilt was featured by our bloggers. But aren’t you impressed with how different they all look? 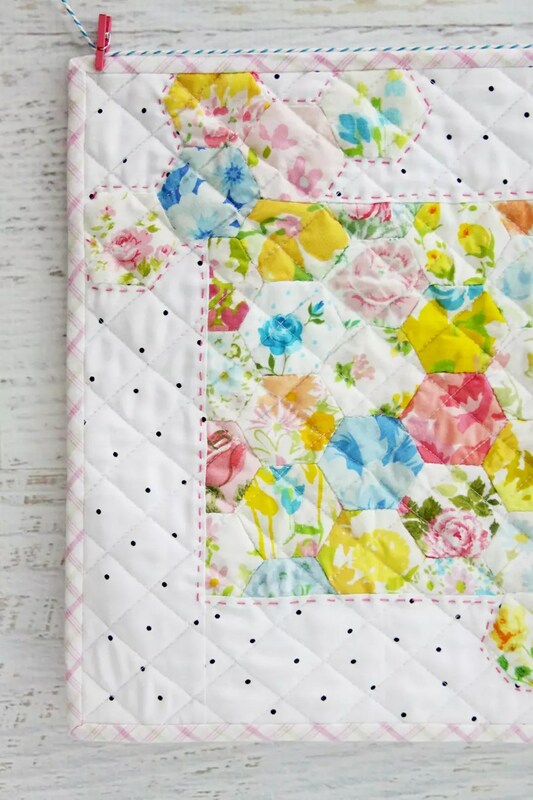 Bev from Flamingo Toes used bright and cheery vintage sheets to create the hexagons for this mini. Then she added extra hexie details too. Cute right? Pop over to Bev’s blog because she’s hosting a GIVEAWAY too! I’m so grateful to all of these lovely ladies for helping to showcase the projects from Pretty Handmades in so many different ways! And I’m really excited about bringing you next week’s projects too. You may have found your way here from one of the bloggers on the book tour. I’d love to offer you a warm welcome! It’s so lovely to have you here. Please take some time to look around, check out the free tutorials, and perhaps sign up for the newsletter if you like what you see. With just over two weeks left for the book tour, there’s still so much to see and some lovely inspiring ideas to be found. Stay tuned for the giveaway that I’ll be hosting next week. And please show our wonderful bloggers some support and pop by and visit them, leave a comment and take a look around.